Are There Too Many Men in the University of Seoul? “You are an idiot if you do not get a boyfriend before you graduate.” It is a joke that is often said to female students at the University of Seoul (UOS). This joke corresponds only to female students. Because there are much more male students than female students in UOS, female students are relatively more likely to have a boyfriend. References that the gender ratio of UOS students is disproportionate can be discovered on almost every search about UOS on websites. That is, a lot of UOS students themselves already recognize the high male to female ratio at UOS. Is it true that the University of Seoul is “the University of Males”? In this article, The UOS Times analyzed the ratio of female and male students and recognized student’s opinions about the phenomenon of a high male to female ratio at UOS. Also, further investigation has been done into complaints of the students at UOS caused by this phenomenon and improvements the students required. In this article, the term “gender ratio” is defined as the number of the males per one female. The UOS Times researched gender ratio of applicants and enrolled students. In the last two years, more male students applied to UOS than female students in all admission types. 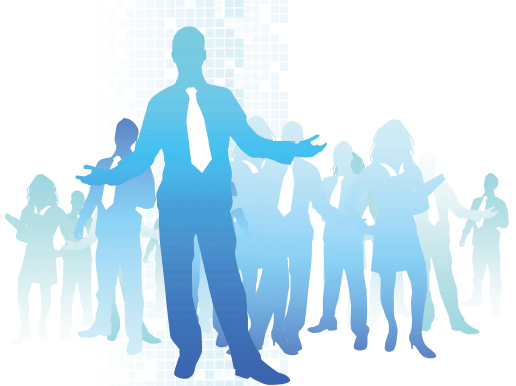 The gender ratio of applicants can be confirmed from Figure 1. Also, gender ratios are higher in regular college admissions than in early college admissions. The number of male students was almost two times that of female students in early college admissions. However, the gender ratio of the applicants in general ga and na types (the 2 types of general admissions to UOS) of regular college admissions is very distinct from that of applicants in early college admissions. The male to female ratio of general ga and na types was 2.56 in 2016 and 2.5 in 2017. The male to female ratio of applicants in school report subject admissions, a newly founded admission type in 2017 admissions, was approximately 1.04. That means the numerical gap between male and female students was not so big in school report subject admissions. In the last two years, the department that has had the biggest numerical gap between two genders was the Department of Mechanical and Information Engineering. 488 males and 60 females applied to this department in 2016, and 557 males and 77 females in 2017. The male to female ratio of applicants of the Department of Mechanical and Information Engineering was 8.13 and 7.23 in 2016 and 2017 respectively. Transfer admission was no exception to this tendency. There were 719 male and 641 female applicants (gender ratio: 1.12) in 2016 general transfer admissions, and 136 male and 117 female applicants (gender ratio: 1.16) in 2016 college transfer admission. There were 726 male and 589 female applicants (gender ratio: 1.23) in 2017 general transfer admission, and 154 female and 108 female applicants (gender ratio: 1.42) in 2017 college transfer admission. In both years, the number of male applicants was not more than two times that of female applicants. In 2016, the department that had the biggest numerical gap between the two genders was the Department of Sport Sciences. 32 males and 4 females applied to this department, marking eight times more male applicants than female applicants. Contrarily, female applicants to the Department of Korean Language and Literature were exactly eight times more than male applicants, recording 16 females and 2 males. In 2017, male applicants to the Department of Mechanical and Information Engineering were exactly nine times more than female applicants, where 36 males and 4 females applied for transfer admissions. It is a solid fact that there are more male students than female students in UOS. According to statistics from the Office of Academic Affairs of UOS (2017.4.1 baseline), the total number of enrolled male students is 8,985 and female enrolled students is 4,042. The gender ratio of enrolled students of UOS is approximately 2.22. This means that there at least two times more male students than female students enrolled in UOS. Among the 37 departments of UOS, 29 departments have more male students than female students. The gender ratio of each department from the graphs can be checked from Figure 2. There are more female students than male students in the Department of Korean Language and Literature, Department of International Relations, Department of Industrial and Visual Design, School of Cross-Disciplinary Studies, Department of Music, Department of Chinese Language and Culture, Department of Environmental Horticulture, and Department of Environmental Sculpture. The gender ratio of the Department of Environmental Sculpture is 0.49, and that was the lowest gender ratio among all the departments in UOS. This means that the number of the female students is just more than two times the number of male students. This result is not surprising compared with the gender ratio of other departments, which have more male students than female students. Except those eight departments mentioned above, there are more male than female students in all other departments. The gender ratio of the departments and school in the College of Engineering is the highest among all the colleges. The gender ratio of the Department of Mechanical and Information Engineering is the highest among all the departments in UOS, recording 15.6. Other departments and the School of Electrical and Computer Engineering also recorded a gender ratio over 5, except the Department of Chemical Engineering that only has three times more male students than female students. The College of Natural Science also showed a high gender ratio of approximately 3.18. The male to female ratio of the Department of Physics was the highest among the departments in the College of Natural Science, recording 5. Gender ratios of the College of Arts and Physical Education and College of Humanities are relatively lower than other colleges. The gender ratio of Sports Science, 3.92, was the highest among those departments. The gender ratio of the College of Arts and Physical Education is about 1.5, and that of the College of Humanities is approximately 1.3. There are four out of nine departments that have more female students than male students. However, overall it was similar with other colleges in UOS in that there are more male students than female students. Does this disproportion only stand out in UOS? In fact, having more male students than female students in a campus is a prevalent phenomenon in many universities in Korea. This even applies to figures for the entire university student population. According to statistics of the Ministry of Education (MOE), female students only made up 43.3 percent of students enrolling in higher education institutions of Korea in 2016. Analyzing individual universities, it is true that there are more male students than female students in Korea. For example, the Kyung Hee University’s (KHU) gender ratio of enrolling students was approximately 1.34 in 2016, which means that there are more male students than female students, though it is a lower rate than that of UOS which was 2.28 in the same year. All of the statistics and figures are based on 2016 provided by the Daehakallimi, a website for information disclosure of higher education institutions operated by the Korean Council for University Education (KCUE). Moreover, universities whose colleges of engineering and natural sciences are bigger than other colleges, such as Hanyang University (HYU) and Kwangwoon University (KWU), usually had higher male gender ratios than the universities that have a greater concentration in social sciences, such as Sogang University (SGU) and Hankuk University of Foreign Studies (HUFS). The gender ratio of HYU and KWU were about 2.05 and 2.95, while the ratio was about 1.75 and 1.11 in SGU and HUFS. The latter still had more male students enrolling than female students but the gender ratio is much smaller than that of the former. However, that rule does not seem to apply on UOS. Statistics tells that UOS is one of the “latter” universities while it has a higher gender ratio than HYU. When comparing the statistics at a department level, the Department of Mechanical Engineering, which is usually considered as a part of the college of engineering in most universities, had a gender ratio of about 13.70 in SGU, 18.1 in HYU, and 9.57 in KHU. Overall, the Department of Mechanical Engineering tends to have more male students than female students. Most other departments related to the field of engineering, such as the Department of Electrical Engineering, showed similar results. This is similar in UOS. In the case of UOS, the Department of Mechanical and Information Engineering also had a high gender ratio of 11.74. The departments related to the field of humanities showed a totally different picture. For example, the Department of Korean Language and Literature of SGU, KHU, HYU, and KWU each had a gender ratio 0.48, 0.58, 0.59, and 1.24 in 2016. This shows that the Department of Korean Language and Literature usually has more female students than male students. Most other departments related to the field of humanities, such as the Department of English Language and Literature and the Department of Philosophy, showed similar results. This contrasts with UOS, most of whose departments in the College of Humanities have a higher proportion of male students. The Department of Korean Language and Literature of UOS, for example, had the gender ratio of 1.12. To look into recognition of the students about the gender ratio of UOS, The UOS Times conducted a survey with about 130 UOS students. When asked about the opinions of the students about the gender ratio of UOS, almost half of the students answered that male students are slightly more than female students in UOS. This was followed by the answer that male students are much more than female students, which accounted for 37 percent. 11.8 percent of the students answered that male students and female students are half each, and 2.4 percent thought female students are slightly more than male students. No one responded that female students are much more than male students in UOS. Most responses about the question were based on visual and superficial impressions of each respondent. Most students answered that “We saw more male students than female students in the campus.” Specifically, reporters confirmed that a lot of students answered that “There are much more male students than female students in the school restaurants and library or when we are walking along the Main Road,” or “we could see a lot of male students in the class or club activities.” Some other students provided their responses based on statistics or documents on the Internet. Actually, more male students preferred to enter UOS compared to female students. According to the survey conducted by Daehakdotcom to high school 3rd grade students in 2015, UOS ranked the 9th of the most favorable university for male students, but UOS was not in the top 10 of the most favorable university for female students. The UOS Times also conducted a survey to 57 high school 3rd grade students to examine their preference about UOS and their perception about the gender ratio of UOS. Among the 34 male respondents, 31 answered that they think “very positively” or “positively” of UOS. The UOS Times thought that the perception of 3rd grade high school students, who would soon take a lot of exams to enter the university, has an effect on the gender ratio of the applicants of UOS. 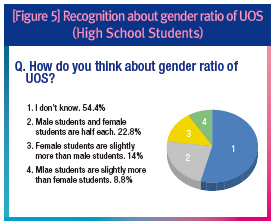 However, high school students’ recognition about gender ratio of UOS was uncertain. Among all the respondents, 31 respondents, 54.4 percent, answered “I don’t know” to the question asking the opinions of the students about the gender ratio of UOS. 14 percent of the students thought there would be slightly more female students than male students, and 22.8 percent of the students responded that they think female students and male students are equal at UOS. Only 5 respondents, 8.8 percent of all respondents, answered that they think there are slightly more male students than female students. No one answered there are much more male students than female students. This perception contrasts heavily with the responses of the enrolled students. Also, UOS officials did not know much about the gender ratio of UOS. The UOS Times asked for interviews to three officers. However, all of them refused the interviews, saying that they do not know certainly and do not have anything to say about gender ratio. According to the same survey mentioned above answered by UOS students, 67.7 percent showed neither positive nor negative response to the question about how they feel about the gender proportion in UOS in terms of studying. Other answers included very positive (2.4 percent), somewhat positive (15 percent), somewhat negative (10.2 percent), and very negative (4.7 percent). The survey also asked about how the students evaluate the gender disproportion in areas not related to studying. To this question, 5.5 percent of the students answered very positive and 20.5 percent answered somewhat positive, while 18.1 percent of the students answered somewhat negative with 6.3 percent answered very negative. Finally the rest of the students, which is 49.6 percent, answered as neither positive nor negative. The survey showed that there are many students who do not really care about the gender disproportion, but also there are some who consider this phenomenon as a problem. Many complaints from the students were related to the male-oriented culture at UOS, which is likely to have formed due to gender disproportion. One student complained, through the survey, being displeased due to some military-like culture and entertainment culture which are usually led by men, since many activities are done mainly by male students. Some of the worries were about sexual harassments from some ill-mannered male students.Other complaints mention that the university society does not consider the female students enough. Unless the gender disproportion gets solved, the mentioned inconveniences will continue to trouble some students of UOS.One solution for this problem is literally turning the gender disproportion situation into a proportionate one. Ways to do this include promotion of UOS so that more people will get to know about the university. Changing the impression and the image people have about UOS might make more female students apply to our school. This solution might require a lot of time and patience, though. 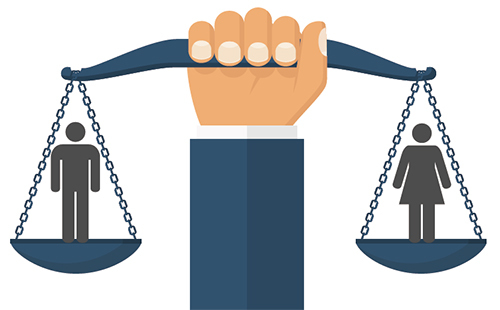 Solving the gender disproportion might sound as a very attractive and simple option, however this might be unfeasible as this solution may not exist. We do not know the clear reason for such a high gender ratio of UOS. Even if we get to know the reason, the reason itself could be something that could not be solved, making the phenomenon unchangeable. This leads to the conclusion that it is more practical to find solutions for individual problems caused by the gender disproportion. Many UOS students answered that there needs to be a system that prevents and acknowledges incidents such as sexual harassment, violence, and discrimination through the above-stated survey. The system will act as a shield in such situations. The male-oriented culture, which some students feel uncomfortable with, might need to change if it continues to provoke problems and inconveniences. A way to make the change is to turn the culture so it is more considerate of others. Considering how females in the minority feel might decrease such unintended inconveniences. For this solution to be practical, such ideas should be common between students. This means that the solution, too, needs promotion, time, and patience. Many UOS students who answered the survey also noted that there should be more lounges for male students, since there are not enough considering the high number of male students. This problem could be simply solved by increasing the number of the lounges. However this solution requires planning by the university administration and securing enough space and budget. The male-oriented gender disproportion in UOS is a phenomenon that is real. To many students, it is just a fact they accept naturally whatever the causes are. Nevertheless, this becomes an issue as it could affect campus life unknowingly, potentially being one of the reasons for incidents and inconveniences. Although the gender disproportion is difficult to solve, efforts to prevent problems caused by the phenomenon will always be needed.